Oh, K., Rajabi Abhari, A., Im, W., Lee, J-H., Shen, Z., Kwon, S., Yeu, S. U., and Lee, H. L. (2019). "Effect of core-shell structure latex on pigment coating properties," BioRes. 14(1), 1241-1251. The pore structure of the coating layer is one of the most important factors in determining the printability of coated papers. The coating pigment and binder are two principal components in paper coating, and their characteristics have a critical influence on the coating structure. The glass transition temperature (Tg) of latex binders affects the mechanical strength and pore structure of the pigment coating layer because the latex Tg influences the binding ability of latex and the shrinkage of the coating layer during the drying process. In this study, styrene-acrylate (S/A) core-shell structure latexes with different monomer compositions in the core and shell layers were designed, and their properties were compared with those of a conventional latex. These core-shell latexes were prepared using the same monomers in the same proportion and were used to investigate the effect of the core-shell structure on the structural and mechanical properties of the coating layer. The hard-shell latex with a high styrene content in the shell part yielded paper that was glossier and less rough and formed finer pores, resulting in an increased ink absorption rate into the coated paper compared to the other types of latex. The hard-shell structure showed better performance in printing uniformity and had less mottling. The primary purpose of paper coating is to improve the printability of paper. This is achieved by forming a porous structure composed of coating pigments and polymeric binders on the surface of base paper. The coating binder is the second most abundant component in paper coating and is used to provide the binding force between the pigment particles and base paper and between pigment particles, which influences the mechanical properties of the coated paper. The binder not only gives the mechanical strength to the coating layer but also changes the pore structure. This is because the binder influences the consolidation of the coating layer during drying, thereby changing the structure of the coating layer. In general, styrene-butadiene (S/B) and styrene-acrylate (S/A) latexes have been widely used as main coating binders because these water-insoluble binders provide a strong binding force and the coating color has a low viscosity. There are several factors that influence the properties of the coating layer, among which the glass transition temperature (Tg) of latex is one of the most important factors, because it greatly affects both the pore structure and the mechanical strength of the coating layer. Several studies have aimed to understand the effect of the Tg of latex on the characteristics of the coating layer and the properties of coated paper. Taber and Stein (1957) have shown that the wet rub, pick rating, varnish holdout, and gloss of coated paper are dependent on the S/B composition and that there are optimal ranges of the Tg for coated paper properties. They have shown that the gloss increases with the incremental increase of the Tg. Lee (1982) investigated the gloss development of the coatings and showed that the Tg of the latex binder has a significant impact. As latex coalesces, the binding strength increases but the gloss decreases due to the shrinkage of the coating layer. By applying this concept, a latex for high gloss coatings which uses hard polymer as a seed and soft polymer as a shell was developed (Lee 1982). Watanabe and Lepoutre (1982) reported the effect of the coating binder on the consolidation of the pigment coating layer. They showed that the consolidation process of the coating layer was influenced by the characteristics of the latex, which affected the gloss and the porosity of the coating layer. The film-forming characteristics of latex have a major influence on the consolidation of the coating layer. 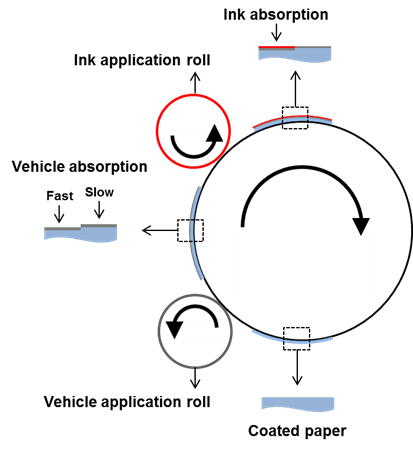 Non-film-forming (high Tg) latex, which leads to the first critical concentration (FCC) more quickly and less shrinkage of the coating layer between the FCC and the second critical concentration (SCC), forms a higher gloss and more porous coating layer compared to film-forming (low Tg) latex (Watanabe and Lepoutre 1982). The structural change of the coating layer influences the printability of coated paper. It has been reported that the ink absorption properties and gloss depend on the S/B composition (Groves et al. 1993). High ink absorbency rates were observed when the latex binder contained a lower amount of butadiene because a more open structure was obtained. The mechanical properties of the coating layer are also greatly influenced by the latex Tg. The film formation of latex plays an important role in the mechanical properties of the coating layer. A high latex Tg gives a coating layer with a low picking resistance (Purfeerst and Van Gilder 1991). This is due to the less film forming and spreading of high Tg latex, which results in a weaker coating layer (Granier and Sartre 1995; Oh et al. 2015). Therefore, when aiming to control the pore characteristics of the coating layer by changing the Tg of latex, the mechanical properties of the coating layer which are greatly affected by this change in the Tg must be considered. In this paper, the effect of the core-shell structure of latex on the properties of the coated paper and coating layers was studied. The structural change of the latex was tested as an option to control the pore structure of the coating layer while acquiring the strong mechanical strength of the coating. Three S/A latexes were used that were designed to have the same overall monomer composition but to be different in the monomer composition at the core and the shell parts of the latex. The dependence of the pore structure and the tensile properties of the coating layer on the latex structure was evaluated. In addition, the effect of the latex structure on the ink absorption characteristics and print mottle of the coated paper was investigated. Commercially produced base paper (woodfree paper) with a grammage of 108 ± 2 g/m2 was supplied by Moorim Paper Co. (Jinju, Korea). Ground calcium carbonate (Setacarb 77K, OMYA Korea, Seoul, Korea) was used as a coating pigment. Particle size and distribution was measured using a laser diffraction particle size analyzer (Mastersize 2000, Malvern, Malvern, UK). Pigment particle size distribution and cumulative volume are shown in Fig. 1. The fraction of particles smaller than 2 μm in the coating pigment was 98%. Three types of styrene n-butyl acrylate latex (S/A latex) were polymerized and used as coating binders. The overall monomer composition of the S/A latexes was identical, and the target Tg of the latexes with the average monomer composition was -14 °C (Table 1). A reference latex was polymerized by feeding the two monomers in the same proportion at a constant feeding rate to the reactor during the whole polymerization process. On the other hand, the hard- and soft-shell latexes were polymerized in two steps. The compositions of the monomer feeds were controlled to obtain either hard- or soft-shell latexes after polymerization. To prepare the hard-shell latex, the amount of monomer that gives high Tg polymer was increased during the polymerization of the shell part, which resulted in glass transition temperatures of the shell and the core of 23 °C and -35 °C, respectively. On the other hand, the soft-shell latex was prepared to have the Tg of the core and shell be at 1 °C and -35 °C, respectively. The overall monomer volume fractions of the styrene and n-butylacrylate were kept constant at 60% and 40%, respectively. Carboxymethyl cellulose (CMC) was used as an additive for the coating color. The average molecular weight and the degree of substitution of CMC were 45,000 g/mol and 0.78, respectively. The coating color was prepared using the ground calcium carbonate (GCC) as a pigment. The contents of latex binder and carboxymethyl cellulose were 12 and 0.1 parts per hundred based on the coating pigment, respectively. The total solids content of the coating color was 64%, and the pH was 9.5. The coating color was applied to the base paper using a laboratory bar coater (GIST, Daejeon, Korea), and then the coated paper was dried in a hot air dryer (120 °C, 120 s). The coated paper was calendered twice using a laboratory soft-nip calender after conditioning at a constant temperature and humidity (23 °C, RH 50%). The line pressure was 130 kgf/cm, and the temperature was 23 °C. The coat weight ranged from 9.9 g/m2 to 27.6 g/m2. The gloss and the roughness of the coated paper were measured with a gloss meter (L&W, Kista, Sweden) and Parker Print-Surf (L&W), respectively. The ink absorption ratio of the coated paper was evaluated in accordance with SCAN-P 70:09 (2008). The ink absorption ratio was calculated based on the brightness before and after ink absorption according to Eq. 1. The brightness of the coated paper before the ink absorption is represented by R∞, and Rs is the brightness after ink absorption. Croda ink (Batch No. MBR 10039 LOT #98698, Flint Group, Luxembourg, Luxembourg) was used and the ink absorption time was 2 min. The pore structure of the coated paper was analyzed by mercury intrusion porosimetry (AutoPore IV 9500, Micromeritics Instruments Corp., Norcross, MA, USA). The coat weight of the calendered coated paper used for porosity measurement was about 15 g/m2. The measured pores ranged from 10 nm to 1,000 nm in diameter. The pores were assumed to be cylindrical in shape and their size was treated as equal to the diameter of the cylinder. The absorption rate of the coated paper was evaluated using a rotary ink tester. 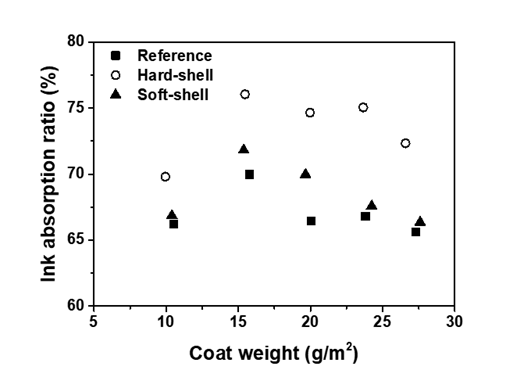 A schematic diagram of the absorption rate test is shown in Fig. 2. The viscosity-controlled ink was applied to the coated paper, and magenta ink was applied again after 5 s and 10 s. After the absorption rate test, the coated paper was scanned to acquire a digital image. The image, which was 1,200 dpi in resolution, was converted to an 8-bit grayscale (0-255) image. 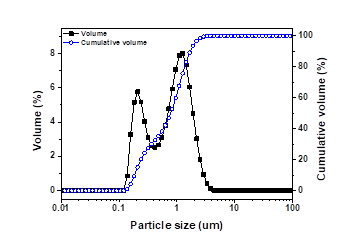 The uniformity of the absorption was measured using STFI-Mottling Expert software (ver. 1.31, Stockholm, Sweden). The coefficient of variation (COV) with the spatial wavelength of 1 mm to 8 mm was used to calculate the mottle index according to Eq. 2. To determine the tensile property of coating layer, the coating color was double coated on the 50 μm thick polyethylene terephthalate (PET) film. The coating was dried at room temperature for 8 h after coating. The dried coating thickness ranged from 50 μm to 55 μm. After stripping off the dried coating carefully from the PET film, the tensile strength was determined using a universal testing machine (UTM Instron 5540, Massachusetts, USA). The width of the specimen and the measurement span were 15 mm and 50 mm, respectively. The strain rate was 25 mm/min. At least 10 samples of the coating strip were prepared. The coating strips with cracks or other damages were not used for testing. The gloss and the roughness of the coated paper prepared using three latexes as binders are depicted as a function of coat weight in Fig. 3. The gloss of the coated paper gradually increased with an increase of the coat weight. The application of more coating improved the coverage and made the surface smoother by filling the low valley areas, which reduced the roughness of the coated paper. The hard-shell latex coating was slightly glossier than the other latex coatings, which was attributed to the low roughness of the coated paper. This shows that even though the monomer composition of the latexes was the same, the structure of the latex influenced the properties of the coated paper. The ink absorption ratio of the coated papers is shown in Fig. 4. The coat weight influenced the absorption ratio of the coated paper. When the coat weight was increased from 10 g/m2 to 15 g/m2, the ink absorption ratio increased because more ink was absorbed by the coating layer. However, when the coat weight was over 15 g/m2, the absorption ratio gradually decreased because the latex that moved to the coating surface closed the surface pores. The hard-shell latex had the highest absorption ratio while the soft-shell latex had a lower absorption ratio, which agrees with the observation by Groves et al. (1993). They reported that high ink absorbency rates were observed when the latex binder contained a lower amount of butadiene because a more open structure was obtained. The low shear viscosity (Brookfield, DV2T) and dewatering amount of the coating color are shown in Table 2. There was no significant difference in the low shear viscosity or the dewatering amount of the coating color; i.e. the structural latexes used in this study did not change the apparent properties of the coating color. Therefore, the changes in the properties of the coated paper were attributable to the structure of the latex and its effect on the consolidation and film forming of the coating layer. The change in the properties of the coated paper is attributable to the difference in the latex structure, because this influences the compressibility of the latex during the drying process. The drying process is divided into three phases based on the solids content of the coating layer. At the FCC, the water-air interfaces recede into the surface pores, generating capillary pressure that causes shrinkage of the coating layer. Less compressible non-film-forming latex is resistant to the capillary pressure generated, resulting in reduced shrinkage of the coating layer between the FCC and the SCC and formation of a glossier and more porous coating structure (Watanabe and Lepoutre 1982). Thus, the hard-shell latex was more resistant to the capillary pressure that developed after the FCC than the other latexes, which resulted in higher gloss and greater ink absorption, as can be seen in Figs. 3 and 4. Figure 5 shows the pore size distribution of the coated papers. The reference and soft-shell latexes had similar pore size distributions, while the hard-shell latex had more pores, especially those with a diameter of 30 nm to 70 nm. Scanning electron micrographs of the surface of the coated papers (Fig. 6) show that the hard-shell latex coating had a more porous surface structure. The difference in the pore size distributions of the coated papers seems to influence the ink absorption ratio, i.e., the hard-shell latex coating had a more porous and open structure coating and resulted in a higher ink absorption ratio. Figure 2 depicts a test that was designed to evaluate the absorption rate of the coated paper in the conditions similar to the printing process. Figure 7 shows the mottle index of the coated papers prepared with the use of three latexes as binders. 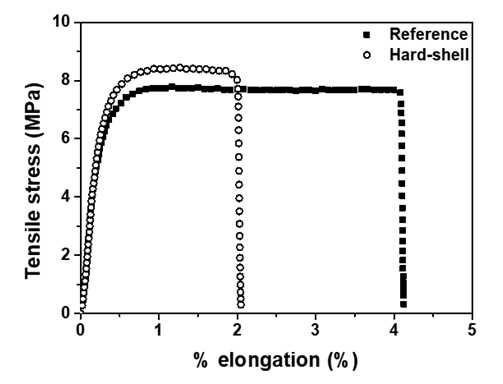 The effect of the coat weight and absorption time elapsed between the vehicle and ink application on the mottle index is shown. The mottle index changed noticeably depending on the absorption time of the vehicle. When the time of the vehicle absorption was 5 s, the mottle indexes of the reference latex papers and hard-shell latex papers increased with the coat weight, while the mottle index of the soft-shell latex papers remained rather constant at coat weights greater than 15.0 g/m2. The hard-shell latex had lower mottle indexes at coat weights from 10.0 g/m2 to 15.0 g/m2 (Fig. 7a). The mottle index was reduced when the vehicle absorption time was increased to 10 s. This was attributed to a more complete absorption of ink vehicle by the coating layer. The mottle indexes of the reference latex papers and soft-shell latex papers increased as the coat weight was increased from 15.0 g/m2 to 24.0 g/m2. However, in the case of the hard-shell latex, no change in the mottle index was observed for all coat weights. The hard-shell latex had the lowest mottle index at all coat weights (Fig. 7b). 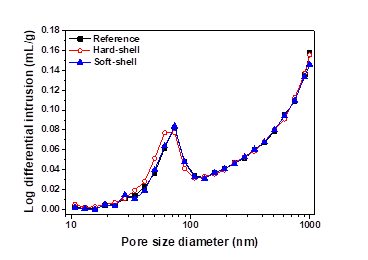 Figure 8 shows the digitized surface images of the coated papers after the ink absorption rate test. The density and the uniformity of the magenta ink on the coated papers can be seen. 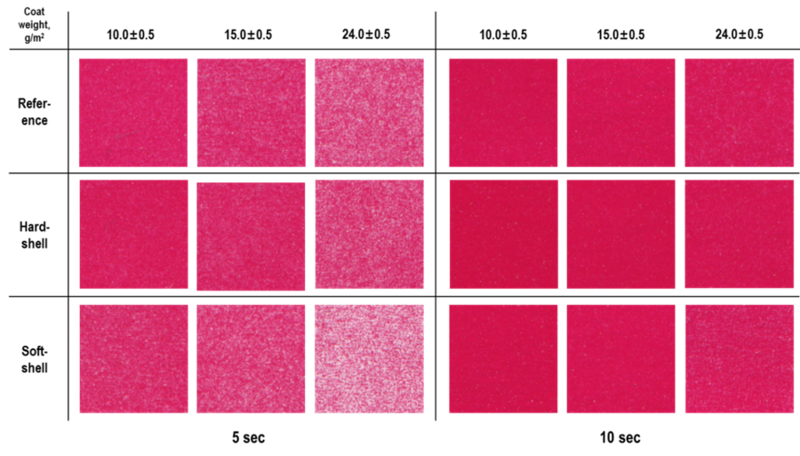 The magenta ink density gradually decreased as the coat weight increased, while the area of low ink density increased as the coat weight increased regardless of the latex types when the vehicle absorption time was 5 s. This indicates that the more closed areas were formed on the surface of the high coat weight papers because the migration of latex increased with the coat weight. It is clear that the hard-shell latex coating had a higher ink density than other coatings, which can be attributed to the greater vehicle absorption of this coating due to its greater porosity. When the vehicle absorption time was increased to 10 s, more ink absorption occurred, which reduced the mottle index. When the coat weight was 10.0 g/m2 and the vehicle absorption time was 10 s, the mottle indexes were similar regardless of the latex types (Fig. 7b). Most of the film splitting occurred in the ink layer because there was enough time for the complete absorption of the vehicle. The difference in the mottle indexes among the coatings increased when the coat weight increased further. The difference in the mottle index was the greatest at the coat weight of 24.0 g/m2. This clearly shows that the hard-shell latex has advantages in forming porous coating layers, improving ink absorption, and decreasing the print mottle. Although the vehicle absorption time was increased to 10 s, some white spots still remained especially on the surface of the reference coatings and the soft-shell coatings. Thus, the vehicle did not completely penetrate into the coatings. This showed that the reference coatings and soft-shell latex coatings absorbed the liquid ink vehicle rather slowly and more unevenly. The hard-shell latex coating showed the smallest variation in the printing density depending on the variation of the coat weight. This is highly advantageous to reduce the print mottling derived from the coat weight variation. Several studies have reported that local variations in coat weight have a great influence on the back-trap mottle (Ozaki et al. 2008; Ragnarsson et al. 2013; Engström 1994; 2016). The mottle of the coated paper decreases with the increase of the coat weight, because the local variation in the coat weight decreases with a higher coat weight. In the present study, however, the mottle index increased with increasing coat weight because of the low mean reflectance value of the high coat weight coatings. This suggests that this method would be useful to evaluate the absorption uniformity of coatings derived from the changes in the pigment or binder at the same coat weight. Figure 9 shows the tensile properties of the coating layer containing the reference latex and hard-shell latex as a binder. It was not possible to prepare the soft-shell latex coating for the tensile testing because the coating layer containing the soft-shell latex adhered to the PET film so strongly that it was not possible to separate the coating layer without damage. The reference latex coating had a much higher elongation property than the hard-shell latex coating, although the hard-shell latex coating had a slightly greater tensile stress at the break. It is clear that the tensile properties of the coating layer can be changed depending on the structural design of the latex even though the chemical composition of the whole latexes was kept the same. The effect of the core-shell structure of latex on the properties of coated paper and the coating layer itself were investigated. Even though the monomer fraction of the latex was the same, the surface properties of coated paper, the pore characteristics, and the mechanical properties of the coating layer were different depending on the latex structure. The hard-shell latex, which had a higher styrene content in the shell part, resulted in a glossier and less rough surface of the coated paper. There was little difference in the pore structure between the reference latex and the soft-shell latex. However, the hard-shell latex formed coating layers with finer pores and had a higher porosity compared to the other latexes. These changes in the coating structure increased the absorption rate of the vehicle and decreased mottling. The mechanical properties of the coating layer were also changed by the structure of the latex. The elongation of the coating layer prepared using the hard-shell latex decreased by about 50%. However, the tensile stress increased by about 15% compared to that of the reference latex. This work was supported by LG Chem, Ltd., and the National Research Foundation of Korea (NRF) grant funded by the Korean government (NRF-2016R1A2B4010562). Groves, R., Penson, J. E., and Ruggles, C. (1993). “Styrene-butadiene latex binders and coating structure,” in: Proceedings of the 1993 Coating Conference, Minneapolis, MN, USA, pp. 187-206. Lee, D. I. (1982). “Development of high-gloss paper coating latexes,” in: TAPPI Coating Conference Proceedings, San Francisco, CA, USA, pp. 125-135. Purfeerst, R. D. and Van Gilder, R. L. (1991). “Tail-edge picking, back-trap mottle and fountain solution interference of model latex coatings on a six-color press predicted by laboratory tests,” in: Proceedings of the 1991 Coating Conference, Montreal, CN, pp. 461-472. SCAN-P 70:09 (2008). “Papers and boards – Ink-absorbency value,” Scandinavian Pulp, Paper and Board Testing Committee. Taber, D. A., and Stein, R. C. (1957). “Effect of latex variables on properties of coating colors and coated papers,” TAPPI J. 40(2), 107-117. Article submitted: October 5, 2018; Peer review completed: November 18, 2018; Revised version received: November 22, 2018; Accepted: November 23, 2018; Published: December 21, 2018.